In Too Dear! by Leo Tolstoy we have the theme of governance, justice, morality and power. Narrated in the third person by an unnamed narrator the reader realises after reading the story that Tolstoy may be exploring the theme of governance. Every time that the King encounters a problem with the prisoner he calls upon his Council of State. Who in turn end up setting up committees and sub-committees in an effort to resolve the issues with the prisoner. This may be important as Tolstoy may be suggesting that the King is unable to govern on his own and is relying on others to govern the Principality of Monaco. It is also noticeable that the most important thing to the King is money. He won’t hang the prisoner because it costs too much money. Then he won’t have a soldier guarding the prisoner because again it costs too much money. Eventually Tolstoy borders on the ridiculous with the prisoner leaving his cell each day and going into the palace to get his own food and then returning to his cell. Still this is too expensive for the King and he offers the prisoner a pension. If anything money overrules the law as far as the King is concerned. It is cheaper for the King to get rid of the prisoner by way of pension than to kill him for the crime he committed (murder). It is also noticeable that nobody in government questions any of the King’s decisions. His word is law which leaves the reader wondering as to why the King needs a government at all. If he is not going to take the advice of his government ministers. All power is based around the King. If the King likes an idea and it is not going to cost him too much money. Then that is the way the King will go. Everything is driven by cost for the King regardless of what an individual’s crime might be. At no stage in the story does the reader suspect that the King thinks any differently. He has been presented with one of the worst crimes possible and has decided it is cheaper to pension off the prisoner. If anything the prisoner has been rewarded for his actions rather than being punished. Which may leave some readers to suggest that what is happening is bizarre. Which may be the point that Tolstoy is attempting to make. He may be suggesting that the King (and his ministers) are not fit to govern. It may also be a case that Tolstoy is highlighting the uniqueness of Monaco. 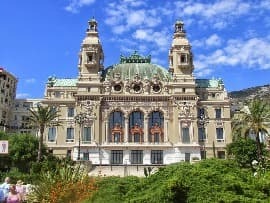 Something that is noticeable by not only the treatment of the prisoner but by the fact that Monaco is the only place in Europe that has gaming houses. It is the taxes from the gaming houses that pay for a lot of the King’s endeavours. He is reliant on the taxes from the gaming houses to keep Monaco (and himself too) afloat. Morals do not appear to be an issue for the King. Unlike in the rest of Europe where gaming houses are not allowed due to the problem that they can create. It would appear that the most important thing for the King is not to abide by the laws of Monaco but to ensure that Monaco has enough money to allow the King to live the life he would like to. The King’s main priority is himself and not his subjects. Which may suggest to some that the King is selfish and that his policies are driven by finances rather than by fairness. The King is not the only one who is acting selfish throughout the story. All his ministers rather than questioning the King’s rulings support the King completely. Most likely because they do not want things to change in Monaco. They in all probability are living comfortable lives as ministers to the King. It is as though they have a thirst for power which blinds them morally. They do after all agree with the King giving the prisoner a pension. Which though ridiculous is nonetheless acceptable in Monaco. Not one minister tackles the King on any of his decisions. As mentioned the King’s word is law regardless of what the courts may say. To an outsider the King’s actions are inappropriate yet nobody in Monaco will challenge the King. If anything the real winner in the story is the prisoner. He gets to leave Monaco and return when his pension is due. With the money he receives he is able to set himself up in business. Yet the same can’t be said for the person that the prisoner killed (or their family). The prisoner has committed a crime and evaded justice all because the King of Monaco does not wish to spend the money on executing the prisoner or feeding him. It is easier and cheaper for the King to give the prisoner a pension even though he is guilty of murder. In all likelihood the King because of the cost involved in executing the prisoner is setting a precedent. McManus, Dermot. "Too Dear! by Leo Tolstoy." The Sitting Bee. The Sitting Bee, 29 Sep. 2017. Web. I would agree it is a good story. Good story! I appreciate it. It’s very easy to understand. Very nice thank you. I’m glad that you found the post helpful.